Capture valuable feedback with simple text messages. SMS surveys are a simple and fast way to collect valuable information for your business or organization. Whether you're looking for people to vote or gather feedback in general, handling it all through text messaging makes things easy. Hundreds of brands rely on SlickText to power their text message surveys and collect feedback at scale. Our text to vote software is easy to set-up, highly configurable, and 100% automated. SMS surveys, also known as "text to vote," are surprisingly simple. You can consider them a modernized way to collect feedback that is handled completely through a series of text messages. You can craft them to be any length, using different types of questions, and with personalized responses for better engagement. We've made the process for setting up text message surveys as easy and efficient as possible. From your SlickText dashboard you'll be able to manage all of your surveys from a simple screen and create new ones with just a few clicks. They can be sent to existing subscribers or when someone texts a unique keyword to your short code. Creating surveys is broken up into 3 simple steps. The first step is for us to collect some basic information about how you want your SMS survey to function. This will include things like what keyword you'd like people to text in order to kick your survey off; How often a person is allowed to take it; and whether or not the responses should be anonymous. The second and most important step in building out your text to vote survey is to add your questions. We support three different question types which are numeric response, multiple choice, and open ended. Each type has its own configuration that allows you to validate people's responses and even map them to custom subscriber fields for future segmentation and retargeting. Additionally, we have full support for merge tags and personalization of all survey questions and responses. This helps make each experience as intimate and engaging as possible. We allow for as few or as many questions as you'd like and give you the ability to edit all of the data at any time. The last step in setting up your text survey is to configure your completion message. This is where you can thank people for participating and even request for them to opt into a mass text messaging list for future engagement. Our system is smart enough to know who is on your list, who isn't, and prevent redundant messages from being sent to anyone. Analytics and reporting is a core component of our text to vote and SMS survey feature. Without good data, there's no reason to conduct one in the first place. Our analytics dashboard provides a wealth of real-time information about your survey results, the respondents, and gives you deep insight into everything you need to know. We'll even show you data on things you didn't consider. Furthermore, we even have support for anonymous SMS surveys so you can collect data without people having to expose who they are or where they're from. When Are SMS Surveys Helpful? Whether you're using text message surveys for marketing or just to collect feedback, there are many ways that they can help. From a marketing perspective, brands will use them to collect customer interest on different products and services. They then use that data to segment their lists and target customers at a more granular level. 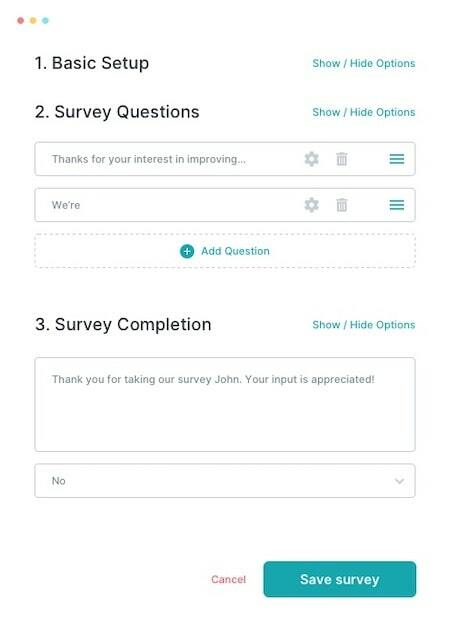 Some companies use surveys to capture feedback on how they're doing or to solicit product reviews. Aside from marketing, many organizations use text to vote to allow people to provide their opinions on important topics. People today are busier than ever and most find that casting a vote via text message makes for the easiest and least intrusive way to voice their opinion. Why Choose SlickText For Your SMS Surveys? Don't waste time fiddling with glitchy services to get your survey up and running. Our SMS software is tried and true with flexible features and a simple setup process. You can have your survey ready for participants in just minutes. After setting up a survey, you'll never have to touch it again. It will run on its own collecting data and interacting with each person individually without any intervention. Our system neatly collects the data in real time so your only job is to analyze the results. Good reporting is key for any survey. With our SMS software, you'll be able to analyze all of the data in a gorgeous, user-friendly dashboard and download the responses and reports to be shared with colleagues. Getting everyone to participate is important. Our text to vote software allows you to segment out people that haven't yet taken your survey or who didn't finish and send them a message to re-engage. Use people's survey responses to segment them into buckets for hyper targeting in future campaigns. By mapping people's response to custom fields you create, you can segment your lists by things like interest and opinion really easily. In more advanced cases, you'll find yourself needing to send survey data to other 3rd party applications. We make this a snap. Whether you need to sync collected emails with 3rd party email services or pass customer data to your CRM, we can pipe the information wherever it needs to go. Launch a Text to Vote Survey Today! Get Started for FREE! Still Have Questions?